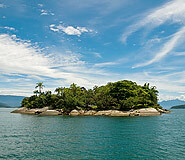 Discover Paraty during your price guaranteed Brazil vacation. All of our Brazil tours have daily departures and are fully customizable. Paraty’s strong colonial character, expressed in the cobbled streets, 18th-century churches, and restored building facades, has made it an attractive destination for anyone who seeks tranquility and a trip into Brazil’s past without the sometimes garish feel of more frequented beach resort towns. 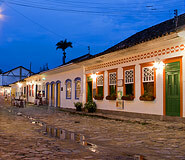 The town is a colonial relic, well preserved and architecturally unique, just 125 miles from Rio de Janeiro. Moreover, it is a site of virtually unmatched natural beauty, being located on the tropical green coast next to a huge bay featuring literally hundreds of little forested islands and crystal clear waters located on Brazil’s southeastern coast. The hilly mainland of Paraty boasts numerous refreshing waterfalls that are the perfect end to one of the many forest trails that exist within the region. The wealth of historical character possessed by this town is due largely to its harbor, which at one time served as an important port for sending and receiving goods from the mining cities in Minas Gerais and was used as a departure point from which to ship the mined gold to Portugal. 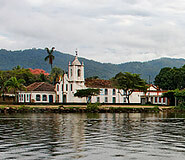 At the end of the 17th century Paraty was one of the most important harbors in Brazil. Incidentally, the name Paraty was virtually synonymous with high-quality rum due to the existence of over 250 sugar cane distilleries. The glory brought about by its port, however, was short-lived, and Paraty lost its vital function when a new road opened from Minas Gerais to Rio de Janeiro. While today the town is no longer the busy, thriving port it once was, the charm and elegance of its architecture remains, and can be calmly admired in the newfound peace and tranquility of its streets. Visitors to Paraty are sure to be swept off their feet by the romantic and untouched atmosphere of the town – not to mention rejuvenated by the time spent lazing on idyllic beaches and islands! The town’s historical center, UNESCO declared World Heritage Site since 1966, is comprised of 40 blocks of quiet streets and leafy green plazas, made even more peaceful by the enforced absence of motorized vehicles within its limits. A stroll through these cobblestone streets provides a unique insight into colonial Brazil, of impressive churches and yet simply decorated public buildings and house fronts. Another very important piece of history remains in Paraty, in the form of the Caminho do Ouro. Paved in the 18th and 19th centuries by slaves, the original 1200km “Gold Trail” once connected Paraty to Diamantina, going through Ouro Preto and Tiradentes. Remaining tracts of the trail have survived in Paraty and can be hiked along during half or full day excursions. For all its history, it is without a doubt the paradisiacal beaches which make Paraty a particularly stunning destination. Protected by its enormous bay, innumerable white sand beaches (some crowded, some quiet) line the verdant shoreline. Additionally, more than 60 tiny islands dot the Paraty harbor, and the warm crystalline waters provide ample opportunity for picture perfect swimming, snorkeling, kayaking, and diving. Half and full day schooner trips are a great way to sample a variety of these lush tropical islets. Active travelers will love the variety of other outdoor fun to be had, such as mountain biking or hiking to nearby waterfalls and natural reserves. The National Park of Bocaina, Joatinga Park Reserve, and the Environmental Protection Area of Cairuçu – where the quaint village of Trindade is located – are all places of rare beauty that have attracted visitors for decades. Even without venturing to these protected areas visitors will marvel at the lush Atlantic Forest that characterizes this region. The thing about a tropical paradise is that there is hardly ever a bad time to go. May to August is the cooler winter period characterized by very little rain; temperatures rarely dip below 68°F (20°C) at this time and tend to stay within 70 and 90°F (22 to 32°C). Paraty’s rainy season is between December and March when humidity is at sky high levels and the days linger at 104°F (40°C). Be sure to bring the proper sun protection clothing and lotions if traveling to one of Brazil’s top beach destinations during the South American summer season. We can't thank you enough for all you did to ensure that we had the best trip possible. Working with you was a pleasure. Our trip was perfect in everyway. Our hotels were lovely and they surpassed our expectations. Can't imagine traveling to South America without all the V.I.P. assistance rendered to my wife and I in making the complicated itinerary actually work, with amazingly smooth connections. Too many things could go wrong as we tall Americans stand out so easily in just dealing with security just as a starter and having a multitude of staff representatives meeting us at airports and train stations, supervising next day's tours with special planning meetings and in hosting us with private drivers daily along with private tour guides who all spoke English fluently.